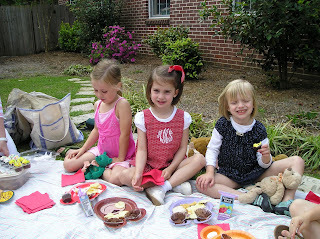 The Teddy Bears have their PICNIC! 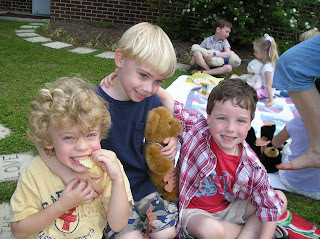 I was fortunate enough to join Sam's class today for their Teddy Bear Picnic. I was so thankful that it was such a beautiful day. Picnic perfect!!! They have been planning this all week. 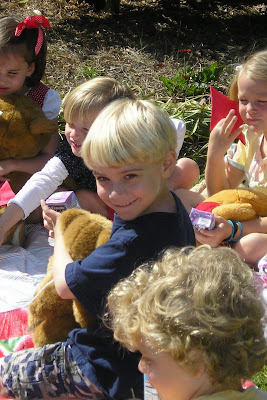 They've introduced their bears to the class and made them name-tags and everything! 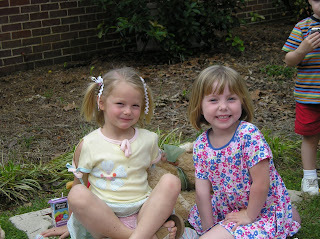 The students got to sit in the Prayer Garden at pre-school and enjoy the gorgeous weather and luncheon. 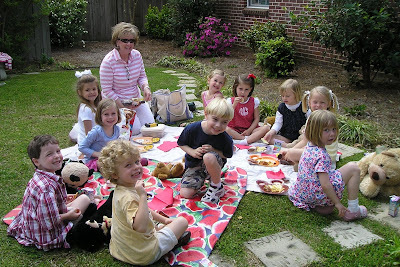 It was a site that brought tears to my eyes as I walked into the garden and saw all those sweet babies sitting on blankets with their favorite Teddies in their laps. Part of me was teary over the fact that Sam is getting big so quickly and will soon be leaving this phase of his life. 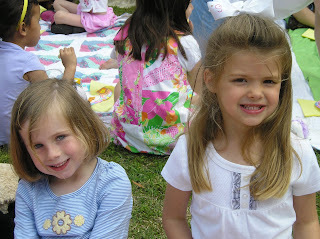 The other part of me was simply charmed by their innocence and the pure joy they get out of such a simple activity. I wish I could have frozen Sam in that moment! What a sweet baby boy!!!! 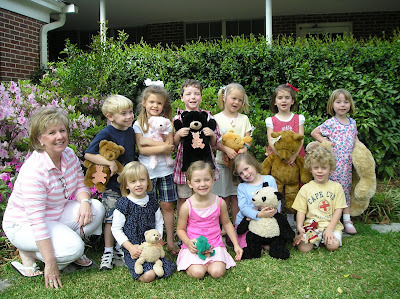 Mrs. Walsh with her more than precious 4-year-olds and their Teddy Bears!!!! you are so talented!!! I love reading everything, and it is so pretty! oh, doll. that made me tear up as usual. you are right; it is the LITTLE moments in life (the ones that don't cost a dime) that make it worth living. ford just fell asleep snuggling with me in the rocking chair with me and i just boo hooed like a baby. i love the blogs. keep them coming. we need more of this in this world. i am so relieved to read that fulton is healthy and better; how scary! all this and hearing of shane has made me so appreciative of life today, and the many blessings GOD has given us that often times go unnoticed.